How 'bout the common two-bit thug that fell into a vat of chemicals that was neither a gangster, someone who previously wore makeup, an agent of chaos or had elaborate plans to overthrow the criminal underworld? The gangster idea doesn't bug me at all. I loved Jack Nicholson's Joker. He was playing the Joker I knew from the comics (with typical Nicholson quirks, but it's not like they didn't fit). The idea that he killed Bruce's parents -- that I hated. As I recall, Sam Hamm, writer of the 1989 BATMAN film, said that it wasn't the Joker that killed Bruce's parents in his original version of the script, but that director Tim Burton made that change. Joker killing the Wayne's in Burton's Batman was a terrible idea. I was enthused about that film back in 1989 when I'd seen the trailer but not the actual film. My enthusiasm waned to a significant degree when I actually saw the film. Truth be told, there is very little I like about that film. The Elfman music, mainly. The Batmobile, and some other elements of Anton Furst's production design. Joker being something of a gangster is no problem for me. Nor being portrayed as an agent of chaos nor having an aptitude for devious plans. The Joker is a foil for Batman. Batman represents justice and order. The Joker is there to disrupt that order. He can only be an effective foil, if he has the wiles to challenge Batman. Nolan's Joker tale wasn't an on-point representation -- it is more like an Elseworld's reinterpreation. The scars and make-up part are particularly ill-conceived, but I thought the performance (and voice) from Ledger worked well and it was a well-crafted film. The character was still a mysterious agent of evil; the film never tells us where he came from or how he came to be. The 'psychobabble' origin elements he spouts are intentionally contradictory and therefore not to be taken at face value. He can only be an effective foil, if he has the wiles to challenge Batman. That’s my issue with the original story that he was a disgruntled lab worker, as well as the addition in THE KILLING JOKE that he was a failed stand-up comedian. The Joker should be someone with the wits to match Batman, someone who has devoted his life to taking down criminals. Being disfigured by a vat of chemicals is not going to transform some lowly schmo into a criminal genius. As much as it adds a lot of baggage, I like Scott Snyder’s update that turned the Red Hood into the Red Hood gang. It was implied that the unidentified leader was the one who fell into the vat, but leaves it open that it was one of the other members of the gang. Joker’s identity should be unverifiable. 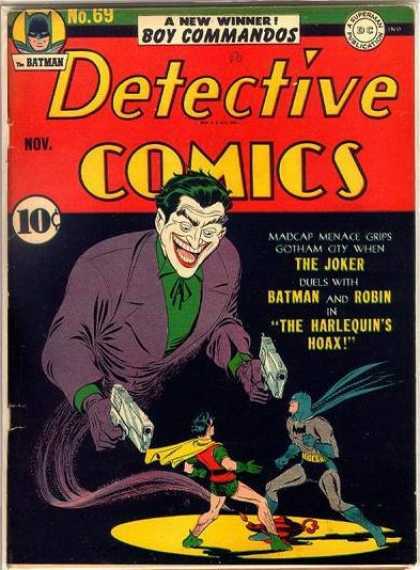 TANGENT: In "JLA: Foreign Bodies", a nightmare scenario is presented to Batman where he envisions the Joker bragging of killing the Waynes, and Batman replies, "Ridiculous. Ignore it." I'm not really a fan of even Joe Chill being identified as the murderer. I prefer the barer bones version of the origin story as told in Detective Comics 33 in which they were killed in a street stick-up by an unidentified thug who was never caught. I dunno, guys. It seems reasonable to me that the World's Greatest Detective should be able to find his parents' murderer. I mind slightly more that Spider-Man found his Uncle's killer so easily. Heh. You're right, Genie Joker is canon! In Nolan's "realistic" (relatively, of course) take, a guy falling into a vat of chemicals and coming out with white skin and green hair and a permanent smile would stick out like a sore thumb. In that universe, the Glasgow Smile makes sense and is spiritually faithful to the idea: it is, after all, a smile he can't take off. On the rest, I agree with you, his mysterious origins and deliberately contradictory statements (taken from The Killing Joke) work perfectly. More than a guy in a black rubber costume racing around in an urban assault vehicle? Embrace the world, or walk away. Don't try to fine tune the details. Peter Parker finding his uncle's killer is pivotal to his origin. It drives home to Peter the folly of his ways in that he was indirectly responsible for his own uncle's death because of his hubris. It's in that moment, when he realizes the murderer is the same man he let escape after a robbery, that Peter decides to live by his uncle's words about responsibility. Batman may have received closure at learning who killed his parents, but knowing who it was did not alter his crusade against crime. Matt H. - I agree with you. That's why I said, "So easily." He happens to overhear that someone is in an abandoned warehouse, and boom - there he is! I would have hoped he would used his identity to find out after a little time. Realistically, it was a short story - but I still think that it was a bit too easy for Petey to make that discovery. In a general sense, I agree with you JB. The Dark Knight trilogy were the last pre-MCU movies in a way, and the MCU changed everything. It was all more flexible, I think. Burton had his version, and it was that. Schumacher had his (horrific) version and it kinda flopped so it was easy for Nolan to pitch an opposite ("realistic") version and they let him roll with it and it worked. In a few years, another guy would come and we'd have another Batman/Joker, it was the way films worked. Nothing was "definitive", really. The very well crafted MCU left DC/Warner in a state of confusion that they can't get past still, and it shows (this JOKER film included). They're in full throwing stuff at the wall and seeing what sticks mode. The Nolan version worked beautifully IMHO for the most part (1st film and almost all of the 2nd) and then it crashed and burned (3rd film). But it wasn't that dramatic, it was just "a" version of the Batman mythos. The pressure that exists today that the whole film universe needs to fit perfectly and every movie must spin off another dozen movies wasn't there yet. Nolan's "realism" is drab. For everything that's wrong with Tim Burton's BATMAN, at least Gotham City is fun to look at. Nolan's is just an ordinary city. And no, I don't like Heath Ledger's "Joker." He's not the Joker. He said he didn't want to echo Jack Nicholson's Joker. Well, frankly, that's exactly what he should have done. Jack did it right. "I am the world's first fully functioning homicidal artist." Works for me. I watched the Nolan trilogy again this week inspired by the discussion in this thread, which I hadn't seen in a long time. Plenty of interesting stuff I didn't remember or failed to notice at the time. Gotham City radically changes from BEGINS to TDK, in the first film the city is much more Burton-esque fantasyland than I remembered, with unrealistic buildings, dramatic fog, etc. None of that carries on to the second film. Even in the last scene where they set up the Joker character for the next film, it doesn't sound like the character we see in TDK at all. Lots of things changed between the two films evidently. Ledger's performance continues to be memorable but it does overpower the rest of the film, which I didn't think at the time. When he's not on screen things are not that interesting. The last 40 or so minutes are really problematic and set the disaster of RISES, which I'd let slip at the time in favor of all the awesome that preceded it. RISES is an even bigger trainwreck than I remembered. Apart from the terrible "Batman takes the blame and retires for eight years" stuff, it's just SO BORING. I think I dozed off for a while. Hathaway's Catwoman is fine, but the character is completely unnecessary for the film's plot. Hardy's Bane is ludicrous and obviously completely unfaithful to the comics (but it's not a character I was ever fond of so OK), but his performance IS entertaining. He does what he can with a nothing character (much like he does in VENOM). The "Blake" stuff... terrible, I can't even begin to understand the reasoning behind that. On Nicholson vs. Ledger, I'm in the latter's camp big time. Nicholson's performance didn't do much for me even as a kid when the film came out (I liked the Hamill BTAS Joker much better). Nicholson seemed like he was phoning it in IMHO. He did his "crazy" cartoony schtick which we had seen before many times and that was it, he was having fun but I don't think he took the role seriously (in his defense, pretty much nobody in Hollywood did with these kinds of films at the time). Ledger for me is another conversation. Maybe he took the character to a sort of logical dead end (much like THE KILLING JOKE did in the comics) but what a performance. You really do believe this guy to be a very dangerous psychopath (the video of him with a kidnapped Batman impersonator that Ledger filmed himself and sent to Nolan is incredibly disturbing and pure Joker). For good or bad he instantly made Nicholson look like a dinosaur, even more so than Nicholson did with Cesar Romero. I take Jack Nicholson's Joker over Heath Ledger's Joker as well. I feel like Nolan "dumbed" everyone down in the film to make Joker more effective. I feel like Nolan "dumbed" everyone down in the film to make Joker more effective. I'm reminded of the scene in which Gordon describes to the mayor all the ways in which they cannot ID the Joker--while looking directly at him sitting in a cell with his makeup still on. "He happens to overhear that someone is in an abandoned warehouse"
Robbie M. - Thank you for correcting me on that one. Save that it was in the early 60s, that policeman almost looks as if it could have been a Stan cameo, like in the movies. 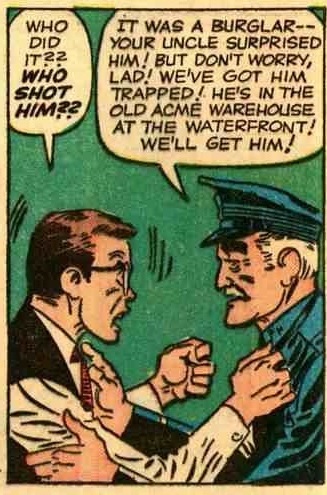 That policeman is J. Jonah Jameson's brother-in-law, AND Willie Lumpkin's third cousin twice removed, on his father's brother's sister's side. Ditch the lame tattoos and capped teeth, and Jared Leto's version would have been decent with a bit of tweaking.